With San Francisco under siege and everyone a suspect, the Women’s Murder Club must risk their lives to save the city-and each other. As Lindsay investigates, shocking video footage of another crime surfaces. A video so horrific that it shakes the city to its core. Their faces obscured by masks, the cold-blooded criminals on the tape could be anyone-and now all of Lindsay’s co-workers are suspects. As a rash of violence sweeps through San Francisco, and public fear and anger grow, Lindsay and her friends must risk their lives in the name of justice-before it’s too late. 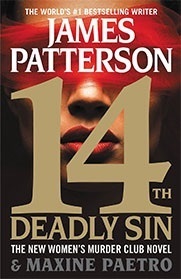 With shocking twists and riveting suspense, 14th DEADLY SIN proves yet again that when it comes to suspense fiction, in the words or Jeffery Deaver: “nobody does it better” than James Patterson.